Tom is meeting his friend in Los Angeles this week for two U2 shows. We decided to turn this into a family holiday in Hawaii where Tom will nip over to LA for a few days in the middle. Tom left on his flight early Friday morning. He flew Sydney-Los Angeles-Honolulu on United and I flew with the kids Sydney-Honolulu on Hawaiian. Our flights were scheduled to come in within 15 minutes of each other in Honolulu. I picked up the kids from school Friday afternoon and we went to do a few last-minute errands at the local shopping centre. Back at home we finished up packing and called for a taxi just after 6pm. I thought this would mean an early arrival at the airport and perhaps avoiding some of the queues. I was wrong. We were at the back of the queue with two and a half hours to go before departure. No hope to purchase an upgrade to Business Class. No worries. Taking two excited, tired kids seemed daunting, but I was optimistic that an overnight flight leaving way past bedtime would mean sleep. Ha. Think again. As we settled into our three middle seats on the Hawaiian A330 the kids appeared ready for bed. They made an attempt at the in-flight entertainment but soon were off to sleep. Ah, peace and quiet. I tried to enjoy my economy meal of green beans, rice and mystery meat in mystery sauce with a side salad of something resembling lettuce, cucumber and tomato. Mediocre at best. Positivity, we are off to Hawaii. Stupidly I forgot to get Sofia motion sickness tablets. She is always sick when we start to descend. And poor Alex, he’s the king of airplane nose bleeds. With tissues at the ready I dozed off for a good hour or two before Alex decided he was up for the night. Followed closely by Sofia who was also up for the night. Meanwhile, my ongoing issues with coccyx/tailbone pain has reared its ugly head again and I am in so much pain it hurts to even shift in my seat. The person in front of me has also settled in for a sleep with a fully- reclined seat leaving me about six inches of space. I could barely squeeze my backpack out from under the seat. After a weak attempt at making sure the kids were good and bored I relented and handed over the iPads wondering how we would cope the rest of the flight and into the day. Surely they would fall back asleep for an hour or two? Never underestimate a child’s resilience to stay awake when they want to. Then the fun began! I won’t go into detail but let’s just say Sofia did get sick. Twice. And Alex had a few nose bleeds. And I was exhausted with severe tailbone pain. Our flight landed on time. We had to deplane and wait in a holding area because the customs/immigration hall was not able to accommodate another flight. Good fun. This was a total of about 30 minutes delay. Because we were in the last few rows of the plane I assumed we would be last through immigration. This delay worked in my favour during this hold. Luckily my kids like to walk fast because I made them bust it down to immigration once they let us out and there were very few people ahead of us. Yay! We picked up luggage, zipped through customs and there was Tom waiting on the other side! Let’s go find the car and start this adventure. 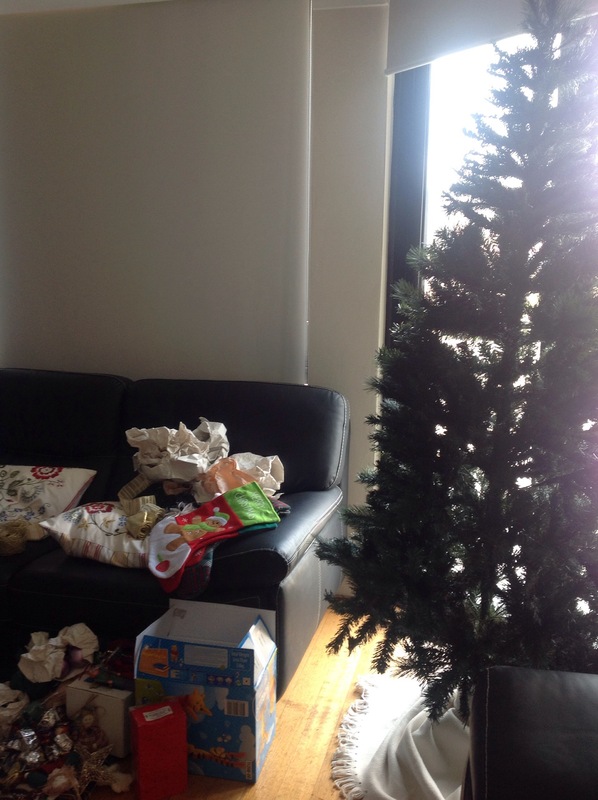 This is our fourth Christmas in Australia and it still doesn’t feel like Christmas. I struggle every year to get into the spirit. There is something about putting up the tree and sweating that doesn’t seem right. I miss the snow, the cold, and family this time of year. For many of the years as expats we spend Christmas on holiday. 2002: England to US. North Dakota, Texas. 2003: England to US. Missouri, Texas, Mexico, Georgia. 2005: England US. Minnesota. North Dakota. North Carolina. California. 2006: England to Chile and Argentina. 2007: England. Sofia born in October. 2008: England to Cyprus and Greece. 2009: England to Sydney for a few weeks before Christmas (initial visit prior to move). England to US. Minnesota. North Dakota. North Carolina. Tom moved to Australia after we returned. Kids and I followed soon after. 2010: Alex born in June. Sydney and around the world. Singapore, Switzerland, Spain, USA (Minnesota, North Dakota, California. 2012: Sydney to Adelaide then road trip to Melbourne. This is probably why I feel a little strange being here at Christmas. Those who know me know that I love to fly and to travel. I’m in Singapore about to board my flight for Sydney. Unless any plans change, I think this will be my last flight in 2013. It was a big year! A lot of work travel but some good trips with the family too. The chart above is courtesy of the Great Circle Mapper, at http://www.gcmap.com.